Winter has descended on the valley and the vineyard. I find it hard to believe another season and another year are drawing to a close. As humans, we have a natural tendency to slow down and turn inward as the days grow shorter and the nights colder. And as the holiday season and the new year approach, we reflect on the past and make resolutions for the future. Al and I live and breathe River Bend every day of the year…whether we want to or not. We reflect on the past…the good, the bad, the sometimes ugly…and make plans for the future. Instead of living the same year over and over, we attempt to learn and grow from one year to the next. So here is a recap of the year that was 2018…and where we’ll go from here. In the winery, we had a year of new releases unlike we have had in the past. In May, we released the first River Bend Rose’. A shortage of Marquette grapes forced us to come up with a new dry rose’ blend, and while I was disappointed that Marquette Rose’ would be no more, I was extremely happy with the new blend. A negative turned into a positive. Mid summer, our Cheers Extended Tirage (ta raj) sparkling wine debuted. We aged this wine for seven years, something I didn’t think I had it in me to do. Seven years is like…forever. In August, our first Reserve wine in four years was released. Our Bourbon Barrel Shiraz was a hit, and sold out in just a few weeks. I do hope the next Reserve reveals itself sooner rather than later. And in September, our first Pinot Noir debuted. To call me a Pinot Noir enthusiast would be an understatement, and now we have one. So where do we go from here? For the next two weekends, the winery and distillery remain open for our holiday Stock Up and Save event…check out www.riverbendvineyard.com/events. Over the winter months, our tasting rooms are closed and cellar work slows down as our wine and spirits quietly age. Al and I will take some time off to recharge and refresh. We’ll brainstorm new wines and concoct new spirits. Come early spring, the whole cycle begins again. One year ends, another begins. We do hope you’ll stay along for the ride. We recently changed our clocks back, and darkness comes earlier now. Fall seems to have vanished overnight with temps that remind me more of January than mid-November. As the seasons change, I find my imbibing practices change as well. In the spring and summer, my drink of choice is generally a crisp and refreshing dry rose’ wine. But come winter, I have become a woman who whiskies. And apparently, it is not just me. There is a so-called Whiskey Renaissance going on in this country, and it may very well be women who are leading the movement. According to the American Craft Spirits Association, “The craft distilling industry is growing with, on average, one distillery opening per day. There are craft distilleries operating in all fifty states, employing close to 20,000 people.” And while there is no standardized definition of “craft”, it generally refers to small batch producers that are family owned and operated, like we are here at River Bend. And while it was my husband’s idea to get into the distillery business, I have found my niche as well…not as the whiskey distiller, but as the whiskey enthusiast. Back in the 1990’s, when I was in my twenties, fifteen percent of whiskey drinkers were female. I was solidly in the other eighty five percent. Today, women represent thirty seven percent of whiskey imbibers in the US, and I have joined the club. So what has changed? Quality for one thing, and people’s tastes for another. Bourbon has stormed the whiskey stage in recent years, with its sweet streak of corn and its bold yet smooth flavor. Cocktails are being made to highlight the spirit, rather than cover it up. And a population…both male and female…who are looking to experience new and different are flocking to craft distillers who are freer to experiment than the mass producers who came before. In cocktail clubs and distilleries around the country, the whiskey Old Fashioned has become new again, and Bourbon Cold Brew just might be a thing. I, for one, am enjoying this Whiskey Renaissance, and I hope you are as well. Autumn in Wisconsin is beautiful. People who know me well know that I will take ninety five and humid over a snow storm any day, but I also enjoy when the heat of Summer subsides and Fall ushers in cooler days and longer nights. As a winemaker, Fall brings the frenzy of the harvest and long hours in the wine cellar, but it’s exciting to envision what the next vintage will become. Unless we are aging reds, many of the wines we are working on now will be available by next summer. But there is one special wine we release each Fall that has patiently awaited its debut since this time last year. Just in time for Thanksgiving, Cranberry Blush is about to make its return. Wisconsin is well known for many things like beer, brats, and cheese curds. As far as fruit farming goes, Wisconsin is not necessarily known for grape production. But Wisconsin is the number one cranberry producing state. In fact, over half of the nation’s cranberries are produced here. So it seemed to make sense that we should produce a wine that was made from cranberries. I learned pretty quickly, however, that wine-making from cranberries was completely different than wine-making from grapes. The first time we attempted to process cranberries, we learned two important things. First, a grape press does not press cranberries. Those little bullets were flying all over the place. Second, once we did have juice, the pH was so low, I knew it would struggle to ferment. So what to do? Fall back on what you know of course. Cranberry Blush is actually a cranberry and grape wine combination. After playing around a bit, we found that a combination of approximately 70% grape juice and 30% cranberry juice could be processed like it was 100% grape. The percentage of cranberry juice did not lower the pH too drastically but still lent the wine its signature sweet and tart flavor. We found someone who could process raw cranberries for us, delivering fresh cranberry juice and eliminating the need to purchase a different piece of equipment. And with that, Cranberry Blush was born. Because it pairs so well with Thanksgiving but the batches we make are small, we hold the release each year until Fall. So this coming Saturday, Cranberry Blush will take center stage, but only for a short time. And then like Fall, it will be gone for another year. And you know what that means…brrrr. It’s been almost ten years since we opened River Bend Winery and a little over two since we opened River Bend Distilling. I don’t think I remember exactly what it was like in the early days of the winery, but I do know the learning curve in the distillery has been steep. Distilling is completely different than wine-making, so we invested in new equipment and learned how to use it. We jumped through the hoops of new federal and state permits. We found new suppliers and designed new packaging. We opened a cocktail bar where we mix signature cocktails that change with the seasons. And now that we are standing on somewhat solid ground, we are taking our spirits “on the road”. By late October, our Bourbon, Gin, and Vodka will be sold in stores…hopefully stores near you! The biggest challenge we have as a craft distiller is volume. Because we have a grain-to-glass business model and feel strongly about the “craft” aspect of distilling, we are extremely hands on in every facet of the process. For example, the corn for our Bourbon comes from a farmer we know personally in Sarona, Wisconsin which is an hour north of our distillery. We own a small hammer mill, and Al mills the grain each Monday for the batch of Bourbon he will start on Tuesday. We use 15-gallon oak barrels that are coopered in Avon, Minnesota specifically for the type of product we make. We filter and bottle in small batches which allows meticulous attention to the product and the process. Each step is time-consuming, and the yield is small. It has taken two years to produce and age enough product to put our spirits in stores. We are finally there, and it feels pretty good! To begin with, our spirits will be available in retail stores that are geographically close to our distillery. Our local population has embraced our products from the beginning, and it just makes sense to put new products into a marketplace where we are recognized. But over time, just like our wine, our spirits will spread out across Wisconsin into stores that recognize and support local producers. And those stores will want to hear from you. If you have a favorite retail store where you buy wine and spirits, and you would like them to carry River Bend, just ask them. If a store knows there is real interest in a product, they feel less risk getting behind it. What separates the national brands and the national chains from the boutique brands and the mom-and-pop’s is you…your interest in supporting local producers. And for that support, we thank you! Blush or rose’ wines can be made in a variety of ways and can take on a wide array of “pinkness”. Our Drink Pink is made predominantly from a grape called Vidal, which is a white wine grape that can be fashioned in many ways. Because we wanted this particular wine to stay very light in color, we added just enough Marquette and Frontenac to turn it what I would call baby pink. It is delicate and refreshing with notes of rose petal and strawberry. It is slightly sweet and best served chilled. It is lovely on its own or pairs with lighter fare like appetizers or seafood. We produce between 40 and 50 cases each year and sell it only in our tasting room. It is a passion project for us, and we hope people enjoy drinking it as much as we enjoy producing it. At some point in our lives, it seems each of us gets touched by cancer, whether the disease hits us personally or inflicts someone we know and love. I rarely discuss my own family’s cancer story because it took years for me to talk about it without crying. My father passed away in July of 2009 due to complications of chemotherapy. We had just staged our grand opening of the winery in June, and the stress of getting the business open was multiplied ten fold when he was diagnosed and then was gone in a matter of weeks. My family cried and grieved, and then I did what my dad would have wanted. I got back to work. There was so much to do, and it was good therapy to throw myself into our new livelihood. Now here we are, nine years later, and I still miss my dad. But I like to think I have made him proud with what we have created here at River Bend. It’s been a lot of work, but he taught me that hard work pays off. He was right. So today, I lift my glass to him and to all of the families who have been touched by cancer. One of the best parts of operating an agriculturally based business is the change of seasons. From March through September, we spend a large amount of time in the vineyard. The season starts with pruning dormant vines in Spring, managing the canopy and the fruit load during Summer, and picking grapes come Fall as we keep a watchful eye on the forecast of frost. This past Saturday, we put a wrap on a bountiful but challenging season, and our attention for the remainder of the year will be in the wine cellar as we go from grapes to the glass. But first, here’s a wrap up of the 2018 season and harvest. Grapevines in any climate thrive in a long, hot summer with just enough rain but not too much. Here in western Wisconsin, we rarely see this perfect scenario. The last time we had a truly hot and fairly dry summer was 2014. This season, we had a good amount of heat in June, but it was accompanied by a lot of rain. Green growth was explosive, and managing the canopy was a battle we waged most of the summer. And then it got dry…really dry. Too dry for the nearby corn, but not too dry for grapes. We were humming along just fine. And then it rained. And rained. And rained some more. In one ten day stretch we recorded twelve inches of rain. For corn, it was too late. For grapes, it could have been too much. Fortunately, our soil drains well in most areas, and with a strong disease management program, we entered the harvest season in good shape. The grapes looked a bit worse for wear, but the chemistries were great and we were able to pick around the rain and before the frost. I always breathe a huge sigh of relief when the fruit is off the vine and in the cellar. I hang up my farmer hat and put on my winemaker hat. One season ends, another begins. Being a small producer, all of the grapes at River Bend are picked by hand…actually by a lot of hands. We picked on three separate weekends in September with three groups of fantastic volunteers. The first weekend, they patiently waited out the rain. The second weekend, it was perfect, cool but sunny. The third weekend, it was cloudy, clammy and cold. The thermometer read 32 degrees at 6am…and everyone still showed up to get the job done. We cannot thank our volunteers enough for another successful harvest. The grapes are on their way to becoming the next vintage of River Bend wine, and we can’t wait to share it with all of our supporters and friends. The majority of the River Bend vineyard is planted to the grapes Frontenac and Frontenac Gris. Because Frontenac Gris is actually a field mutation of Frontenac, the two varieties tend to ripen at the same rate. We have historically picked our Frontenac Gris first and our Frontenac last. By mid-September, we begin to worry about frost, and getting both varieties off the the vine by the end of the month is our goal. As expected, when we tested the fruit this past week, both varieties were ready and our plan to pick the Front Gris first and the Frontenac one week later was confirmed. On Wednesday, we looked at the long range weather forecast and the size of our picking crews for each weekend, and I panicked just a little. We had 45 people coming to pick Frontenac Gris on Saturday and only half that many for Frontenac the next weekend. The long range forecast was dismal. So we decided to pick the Gris as planned, and some of the Frontenac on the same day. With a large picking crew, we knew the volume was manageable. But two things concerned me. First, it meant getting much more of the vineyard ready for picking, knowing we would be working non-stop in the rain. And second, the two varieties have a similar skin color, but Front Gris presses white and Frontenac presses rose’. Mixing the two in the picking bins would be disastrous. We have never picked these two varieties together for this reason, but this year we had no choice. But as they tend to do, things worked out just fine. We do not melt in the rain, by Friday the nets were off, the vineyard floor was mowed, and the bins and buckets were in place by Saturday morning. Picking day dawned cold but beautifully sunny. Our fabulous crew of harvesters took my worries of “cross contamination” in the bins seriously, and the white wine producing Front Gris was not mixed with the rose’ producing Frontenac. All of the grapes were off the vine before eleven am, just in time to have a champagne toast in the field before heading in for a well-deserved lunch on the patio. With only one more weekend to go, I now believe we will survive another harvest season. To all of our volunteers, THANK YOU for a great day of friendship and harvest. The community that comes together every year to get our fruit off the vine is amazing, and we are extremely grateful. To our volunteers, we raise our glass... Cheers to all of you! Coming up this Saturday, we are releasing our first ever Pinot Noir. I have wanted to make Pinot ever since Al and I made our first trip to the Willamette Valley in Oregon in 2008. This part of Oregon is Pinot country, and most of the producers are boutique wineries that focus predominantly on this one variety. I fell so hard for Pinot Noir that when we got a puppy in 2011, we named him Pino. We changed the spelling a bit because I was afraid non-wine enthusiasts might think his name was pronounced Pie-not. So here we are, ten years after our first trip to Oregon and seven years after we got our puppy, and we finally have our first Pinot Noir. On the world wine stage, Cabernet Sauvignon always gets the starring role and Pinot Noir is forever the understudy. Cab is known for being big and bold, and winos use words like "jammy" and "chewy" to describe its mouthfeel and "smoke" and "tobacco" to describe its aroma. People love to gush about Cab, and if bigger is always better, then Cab is your wine. Don't get me wrong...I love a good Cab. And a good Merlot. And a good Shiraz. A bold red and a medium-rare filet mignon is about the best food pairing out there. But if I had to pick one red wine to spend the rest of my dinners with, it would be Pinot Noir. Why? I have two main reasons...versatility and approachability. Burgundian varieties like Pinot Noir tend to be lighter and more delicate than Bordeaux varieties like Cab and Merlot. Grown in cooler climates, Pinot Noir grapes do not develop as much tannin as Cab, and therefore do not come across as dry. Pinot is most often finished with little to no residual sugar, but its softer tannin structure gives it a different mouthfeel...what I refer to above as approachability. Young Cabs are often harsh due to their high tannin content and are best consumed after extended aging. Pinot Noirs age very well, but are drinkable much younger due to their soft tannin structure. And when it comes to food pairing, Pinot Noir is incredibly versatile. A big, bold Cab can overpower a lighter meal, but Pinot plays nicely with a large variety of food. Steak and Pinot Noir? For sure. Mushroom Risotto? You bet. Crab cakes? Yes, please. Chicken Cordon Bleu? Yes, even chicken pairs with Pinot Noir. A hard day at work? A glass of Pinot pairs well with that too. So this coming weekend, after ten years of being Pinot Noir lovers, we are now Pinot Noir producers. Stylistically, it is lighter and more delicate than most reds. It is fruit forward with a structured mid-palate and a smooth finish. There is a hint of oak but not too much. And it is versatile with food. Since bottling, I've tried it with most of the meals mentioned above (as well as the hard day). But don't take my word for it...stop in this weekend and try it yourself. We look forward to seeing you! Harvest season at River Bend officially kicked off on Saturday with our Brianna grapes coming off the vine. After patiently waiting out the morning rain, our volunteer picking crew got after it and by 10:30 Saturday morning, all of the Brianna was in the bins, ready to press. The harvest was a bit smaller than anticipated and the birds decided they liked Brianna quite a bit this year. But today we have juice in the tank and by week's end, the juice will technically be wine. Once fermentation is complete, it will take several months for this wine to actually be bottle ready, but the first few steps of taking grapes to the glass are complete, and all is right with the world. Most small producers harvest grapes by hand. Most large producers harvest grapes by machine. Harvesting by hand has two distinct advantages. The first is that we are able to do some sorting of the berries, both in the field and at the press. As I mentioned, the birds found our Brianna earlier than normal this year, so there was a bit more "bird strike" than we have seen in the past. Birds are quite finicky about their grapes, so they test them by pecking holes in them, and when they are not ripe enough, they leave them on the vine that way. After a few days, these berries dry up, and if you have been vigilant with your disease management program, they cause few problems. With all of the rain we saw in the past few weeks, we are fortunate that Al is the vigilant type and that his disease management has been solid all summer. The second advantage to harvesting by hand is that the majority of the clusters remain intact. Grapes that are intact do not start fermenting on their own. Berries harvested by machine, however, get pretty beat up and will start juicing before you can get them to the press. Juice in the bottom of the bin can start fermenting on its own due to wild yeast that is present in the air. Machine harvested grapes must be pressed immediately to avoid wild fermentation. Large producers are able to pull this off because they have a large labor force. Small producers do most processing with just a few people, so having intact fruit on the way to the press buys time. The one disadvantage to harvesting grapes by hand is the number of hands that are needed. With just the two of us, Al and I can press four tons of fruit per day once it has been picked. However, harvesting four tons requires forty pickers minimum if you want it picked in one day...and preferably in one morning. And that is where our awesome volunteers come in. Each year, we put the word out through social media and our email newsletter when picking time is drawing near. And our customers never disappoint. I hope and believe they actually enjoy coming out to help us bring in the harvest. We have several people who come every year...sometimes on every picking weekend...and we always have new folks who want to share in the experience. If we plan it right...and mother nature cooperates...we are in the field by 8:30 on a Saturday morning and back having lunch and wine before noon. Having a hand in harvesting the fruit provides a "grapes to the glass" perspective that people otherwise do not have. I like to think it helps connect them to us and the wine in a more personal way. So to all of the volunteers that came out this past weekend and to all who have signed up for later in September, we offer a heartfelt Thank You! We truly could not do it without you. For the past few weeks, we have spent the majority of our time in the vineyard. Harvest is fast approaching, and there is always much work to be done as we near the end of the growing season. But that does not mean we can put all other tasks on hold. Wine processing and distilling continue, and we just accomplished a milestone in the distillery that we have been working toward for two years. Being a craft distiller, our batches are small and up until very recently, all finished spirits were bottled in 375ml bottles. We now have enough volume to go into 750ml bottles which is the industry standard. The high quality of the spirits is the same, and we can offer more bang for the buck in the larger format bottles. So we can talk all day about our spirits being "hand crafted" and "small batch" and "high quality" when compared with other spirits on the market. And while we believe it to be true, what really matters is what our customers believe. So when we opened our distillery tasting room, our philosophy was to showcase our spirits by having a limited but well thought out cocktail menu. While people often sample spirits straight, vodka, gin and whiskey are by definition quite strong...each is federally mandated to be at least 40% alcohol by volume. And so we create what we feel are "signature" cocktails for each of our spirits for people to enjoy in the tasting room. Enter Josh, our tasting room manager, marketing coordinator, and mixologist extrodinaire. Every two weeks, Josh creates a featured cocktail, "showcasing" one of our main spirits. And he is good at it! If you follow River Bend on Facebook, you have no doubt seen our cocktail features. Each is sampled ahead of time by our management team (yes, it is a tough job), tweaked if needed, and carefully photographed. I hope if you have tried any of them, you will agree they are as tasty as they are beautiful. The spirit itself is neither overwhelming nor covered up, the citrus is always fresh squeezed, and the mixes are most often hand made. This week the featured cocktail is a Singapore Sling, and you will feel as though you are in the tropics. As we head into fall, features like the Craftsman Caramel Apple reflect the cooler weather. Come December, you will see cocktails that are creamy and warm like the White Christmas. A few our our recipes are so special we keep them proprietary, but most often if you try a featured cocktail you really love, Josh will tell you just how to make it at home. With Craftsman spirits of course! This past week, Al and I spent nearly every waking moment in the vineyard. Somehow it is late August, and that means the grapes are adding on sugar and the birds all know it. We have a telephone wire that runs the length of the vineyard, and at this time of year I swear I can hear the birds on that wire taunting us. "Are they ripe yet? Let me check. Oh, not yet, but I'll take some and drop them on the ground anyway. And then I will test them again tomorrow. If they are ready tomorrow, I'll be sure to call all my little bird friends!" I used to really like birds. Now, not so much. If we did not net the vineyard, they would pick it clean before we could even say the word harvest. And so we net. 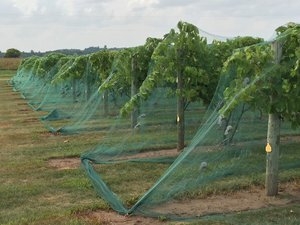 Before we can apply the nets, the vineyard needs to be hedged and all of the prunings that come off must be cleared from the vineyard floor. This is a job that takes two of us two solid days. After hedging, the aisles must be mowed, because once the nets go on, you can no longer get a tractor down the row. Once it is mowed, we apply the nets. This job takes four of us a full day. The nets are seventeen feet wide and a quarter mile long. We have a nifty contraption called a Netter Getter that attaches to the back of the tractor and runs the net along the tops of the rows. One person drives, one feeds netting out of the basket, and two walk along and pull the netting down to the ground. In all, we put on about five miles of netting. By the end of the day, I am exhausted. And the birds are mad. And now our attention turns to harvest, which will start in just a couple of weeks. Brianna comes off first, this year on Labor Day weekend. Then we wait a few weeks and tackle the Frontenac and the Frontenac Gris. We harvest by hand with volunteers, and if you've never done it, the grape harvest is actually very fun. You can sign up to help us by calling the winery for all of the details. If you're a River Bend wine enthusiast, it's a great way to see how your favorite wine goes from the grape to the glass. We'd love to have you join us! This past weekend, we released a special version of our sparkling wine Cheers. This edition...our 5th...aged on the yeast for seven years, which in wine-making circles is called extended tirage (tuh-raj). Not all grapes are suitable for sparkling wine production, and we are fortunate that Frontenac Gris is not only suitable, but darn close to ideal. Moderate sugar levels and high acidity at harvest make for a balanced bubbly, and Frontenac Gris has both. Last year, our 4th edition Cheers won a gold medal in a professional wine competition...and promptly sold out. Because Frontenac Gris is a versatile grape, we use it in several different wines. For that reason, our batches of bubbly are usually quite limited. Frontenac Gris is a Univeristy of Minnesota grape that became available for planting in the early 2000's. It is technically a field mutation of Frontenac, and it is therefore just as cold hardy and disease resistant. As a northern grower, this is just what we are looking for. What we didn't realize early on was how versatile this grape would become in the wine cellar. One of the first wines we produced with it was Bliss, a dessert-style wine that is pleasantly sweet but retains a nice clean finish. High acidity at harvest is what keeps a sweet wine from becoming cloying, and Frontenac Gris has acidity to spare. With tropical fruit notes we like to call "pineapply-pear", Bliss is lovely on its own and also pairs well with a dark chocolate brownie or truffle. Yum. Frontenac Gris is also part of two of our most popular wines, Moonlight and Summer White. Moonlight has been in our wine line-up since 2009 and is loved by the Moscato drinker. Summer White came a few years later, and is a blend of estate-grown Brianna and Front Gris. If you have been a River Bend enthusiast for awhile, you may remember a wine called Jasmine that was created for and sold exclusively by a local grocery store chain. That chain is no longer in business, but Jasmine lives on...it is now Summer White and is sold exclusively in our tasting room in Chippewa Falls. I mentioned that Frontenac Gris is a field mutation. It's close sibling Frontenac is also a cold hardy variety that we use in multiple wines. We'll highlight Frontenac next time, and talk about a wine called Magenta that holds a special place in our history. Frontenac grapes when ripe are a very deep purple. At the onset of veraison, the berries will change from green to light purple to dark purple. When pressed to juice, the color of the skins is the dominant factor in the color of the wine...and young red wine is indeed almost purple in color. Aging, especially over a long period of time in oak barrels, will turn the wine from purple to red. Color in red wine is a good indicator of age. The more vibrant the color, the younger the wine. The more brick red the color, the older the wine. And older is good, right? Maybe, maybe not. But that's a whole 'nother story. In the case of Frontenac grapes, we can also minimize the color by removing the juice from the skins early in the process. We make a wine called Magenta that is a brilliant...wait for it...magenta color. We accomplish this by separating the dark skins from the juice early on, thereby lightening and brightening the color. Veraison in white wine varieties is much harder to see. The berries stay green for a long time, and the first sign of ripening is what I like to call freckles. Tiny brown dots begin to appear on the skins, and after a few weeks, subtle color change occurs. The ripe grapes never become white...they are golden in color. Inside, the juice is very light in color, and when pressed immediately off the skins, white or almost clear juice is produced. Age and barrel time also affect white wine, and an older wine may begin to take on a straw color. Good or bad? Hard to say. Some white wines age very well, and more color simply indicates a white wine that has likely aged for a few years. What really matters is taste...your taste and no one else's. We always like to say the first rule in wine drinking is that there are no rules. Just drink what you like! Tennessee and Kentucky have been the epicenter of American distilling for decades. The brands Jim Beam and Jack Daniels are household names, and a Jack and Coke can be ordered in any bar that hocks whiskey. But there are now craft distilleries in every state that allows them, and distillery trails...while not as common as wine trails...are becoming popular in areas where tourism is important to the local economy. So how does a distillery in an up-and-coming region distinguish itself from the big boys? To me, there are two distinct ways. The first is craftsmanship, and the second is local sourcing. When Al told me he wanted to start a distillery, I was skeptical. After all, we were already operating a vineyard and a winery, and neither of us was sitting around twiddling our thumbs. But Al is a craftsman. From his days as an amateur boat builder to his career as a professional cabinet maker, he has always been able to take raw materials like fiberglass or rough cut lumber and turn them into sailing vessels or kitchen islands. Even though we share the production responsibilities of wine making, he has always considered wine to be "my thing." Distilling would be "his thing". So he researched the distilling process and the equipment, went to seminars, and made test batches. His recipes are all his own. And while there are legal requirements regarding what grains can be used to make Bourbon or Rye or Single Malt whiskey, the mash bill and the process by which our whiskies are created are all uniquely Al. And if you know Al, you know that quality is his middle name. Actually it's Rolland, but that doesn't fit the story. So how best to go about making high quality whiskies? Of course one must have good distilling equipment, well constructed barrels, and good sanitation practices. But first, one must have high quality raw materials from a consistent supplier. Since the majority of our farm is planted to grapes, and we wanted to produce our whiskies from 100% Wisconsin grain 100% of the time, Al contacted Perlick Farms in Sarona. Perlick Farms also happens to be the home of Perlick Distillery, and it was evident from the beginning that the Perlick family shared our philosophy on local sourcing and quality distilling. Sourcing any product locally beats having it shipped in from Timbuktu, and being able to source our grain from a reliable local supplier is an important part of our brand. Craftsmanship and local soucing allow us to produce a high quality product, and it is something we commit to every day, whether its in the wine cellar or the distillery. As we like to say, "Quality is not an act, it is a habit," which is a quote from the Greek philosopher Aristotle, as true today as it was in the 4th century BC. When wine is cooled, some of its chemical components bind with others and become insoluble. This is what happens when tartaric acid combines with potassium, forming potassium bitartrate. As the temperature of the wine drops, its ability to keep this combo in solution drops as well. In temperatures around 40 degrees...which is likely what your refrigerator is set to...tartrate crystals form. No one likes to take a sip of wine and get a mouthful of crystals. To ensure this does not happen with a wine you are likely to chill, we put our wine through a cold stability process meant to force the crystal formation while the wine is still in the tank. We chill the wine to approximately 30 degrees, saturate it with potassium bitartrate (the same stuff we are trying to take out), and circulate the wine for two hours. The addition of the potassium bitartrate draws out and binds the crystals that are forming naturally, and after a settling period of a few days, the heavy crystals drop to the bottom of the tank. We rack the clear wine off into another tank, and voila'...the tartrate crystals stay behind. Now you can put Sunset or Moonlight in your fridge and not worry about wine diamonds in your glass. While the presence of tartrate crystals in wine does not alter the taste, the industry considers crystal formation in white wines to be a flaw. A white wine entered into a professional competition with wine diamonds will never receive a medal, no matter how good the wine tastes. Red wines, however, are not intended to be chilled. Because of this, most reds are not put through a cold stability process prior to bottling. If you prefer your reds with a bit of a chill, crystal formation may very well occur. Whew...thanks for hanging with me on that incredibly interesting topic. I do love being a wine geek! In the Vineyard - Baby, it's hot outside! Every summer, the 4th of July creeps up on me. It seems we were just dealing with a late spring snowstorm, and this past weekend, everyone is lamenting the heat wave. Except the grapevines. Grapevines never complain about too much heat. The hotter the better. Ninety five degrees at the end of June...bring it on! Five inches of rain in one night...you bet! Have a seat and watch us grow! If you were to show me a picture of the River Bend vineyard as it looks today, I would be inclined to believe it was mid-August by how much foliage the heat and rain have produced so far. It is not every year that we experience a truly hot summer here in Wisconsin. In fact, it's pretty rare. The last one I remember was 2014. The past few years, we have reached 90 degrees just a handful of times all summer. So far this season, River Bend has recorded 90+ degrees on five distinct days...that's pretty impressive for the end of June. Because we have a short growing season...relative to grape growing areas like California or Washington...packing as much heat as possible into the summer is favorable to grape development. One of the key components of grape chemistry is organic acid, and in a cool or wet year, acids do not drop as much as we would like. To get organic acids to drop, the vines basically need to sweat them out, so a hot year generally means lower acidity when it comes time to harvest. So why does the level of acidity matter? Lower organic acids at harvest give a winemaker flexibility in the style of wine they can produce in a given year. Grapes grown in a northern climate like ours are often too high in acid to produce a quality dry red wine. Acidity is balanced by sweetness, and a dry wine that is too high in acid will be tart...and not desirable. A dry wine with lower acid will be smoother and more approachable. As I mentioned, the last year I would categorize as hot here in our neck of the woods was 2014. That year we produced a dry red wine from Marquette grapes that won a gold medal in a professional competition. The heat reduced the acidity, allowing us to make a nicely balanced dry Marquette. It's too early to tell if this season is shaping up to be dry red wine producing, but we are off to a good start. Stay tuned, and we will see what happens come late September. Ever since planting our first vines in 2006, we have had a philosophy about the wine we would produce from them. Growing grapes in a cold climate is far different from growing them in a warm climate, and we have always said we would not try to make our grapes into something they were not. As an example, we only produce dry red wine from Marquette grapes in the hottest and driest of seasons...to do so in a cool or wet year just does not produce a good dry Marquette. However, grapes grown in our micro climate will produce excellent bubbly in almost any year, which is why we ventured into the sparkling wine niche soon after opening the winery. I have always wanted to produce sparkling wine the way the French do, which is to produce carbonation naturally with a second fermentation that happens in the very bottle from which the wine will be consumed. Grapes we grow in Wisconsin, and Frontenac Gris specifically, are ideally suited to this style of sparkling wine. At peak maturity, we have relatively low sugar and high acidity, both of which make for good bubbly. So first we produce a still wine, and then we bottle it down with additional yeast and sugar. The wine re-ferments in the bottle, producing a bit of additional alcohol and a whole lot of carbonation. The wine is then "laid down" to age. The batch we are releasing this year was laid down in 2011...an "extended tirage" or extended aging period of seven years. I am not a patient person by nature, so for me, this has been excruciating. But it was the plan all along, so we have waited. And waited. And waited some more. Finally, the time has come to release our first...and possibly only...extended tirage sparkling wine. But before we can release this wine, we have to remove the yeast from the bottle, and for this procedure, we need help. So we pack up the bottles in a metal cage and ship it to L Mawby Winery in Suttons Bay, Michigan. Larry Mawby planted his vineyard in the early 70's, and before long recognized the climate of northern Michigan was ideally suited to making sparkling wine. He has since become nationally recognized for his bubbly, but yet remains extremely approachable and helpful to new producers. We have been making the trek to Suttons Bay every other year since 2010 to have our sparkling wine disgorged at the one and only L Mawby Winery. make every day a celebration! Seven years aging sur lees (on the yeast) has made for a beautifully complex sparkling wine. The fruit-iness of Frontenac Gris has been muted a bit, and there is a toasty characteristic not found in batches released at a younger age. If you are a true Champagne enthusiast, this is a sparkling wine you must try. It would be remiss of me if I did not recognize the crew at L Mawby, so many thanks go out to Tony, Bill, and the rest of the production team who took such good care of us on our trip to Michigan this year. If you find yourself anywhere near Traverse City, definitely work in a side trip to Suttons Bay and L Mawby. I promise you will not be disappointed. In the Winery - Come quickly, I am tasting the stars! The French monk Dom Pierre Perignon is often given credit for the invention of Champagne. Whether or not the story rings true, it is still a good story. Legend has it the monk was having a problem with bubbles forming in wine that was supposed to be still. On a whim, he tried the bubbly wine and exclaimed "Come quickly, I am tasting the stars!" ...which is one of my all-time favorite wine quotes. If this did indeed happen, what was occurring was a re-fermentation after the wine had been bottled. The process of fermentation converts sugar into alcohol and as a by-product you also get carbon dioxide. Trapped inside a bottle, carbon dioxide creates bubbles or fizz, just like a can of soda. Trapped carbon dioxide gives wine it's stars...or as we say today, it's sparkle. There are several ways to add carbon dioxide to wine, but the traditional French method is the oldest and the best. After juice is fermented into wine, the still wine is bottled and yeast and sugar are added...to each and every bottle individually. The result is a second fermentation where the yeast converts the sugar to a small amount of additional alcohol and creates carbon dioxide, which...you guessed it...is now trapped in the bottle. Producing sparkling wine by this method provides a high level of carbonation and the tiniest of bubbles, both of which are desired for a well-balanced sparkling wine. But at some point, the yeast that's in the bottle needs to be removed. This is a process that requires specialized equipment that not many wineries in the Midwest possess. So, every two years, Al and I make a trip to a winery in Suttons Bay, Michigan. There, under the guidance of sparkling guru Larry Mawby, our wine is disgorged. This is the process by which the yeast is removed from the bottle, but the carbon dioxide is retained. We'll talk more about this process in next week's blog, and we'll have some photos from the Mawby winery to show as well. Have I mentioned yet that this is a very special version of our sparkling wine? This particular batch is what we call an "extended tirage". I'll explain that in more detail next week too, so please stay tuned. Here's a hint...we've been waiting for this for seven years.